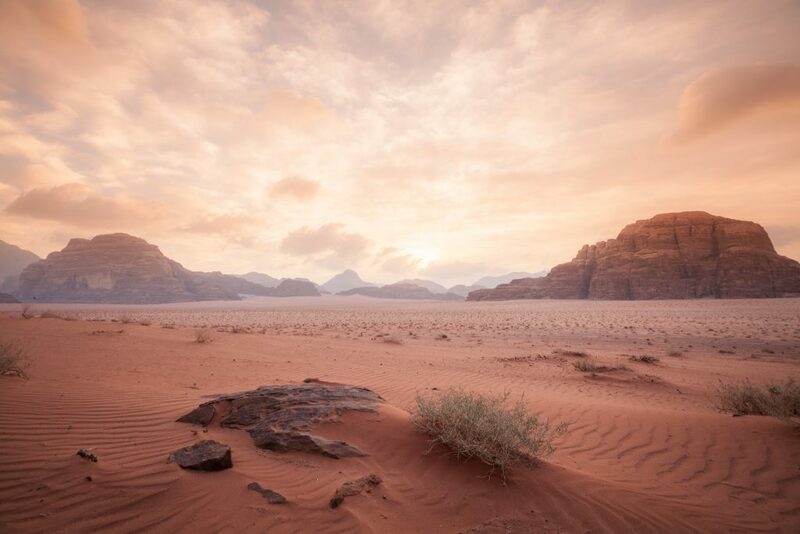 The location of the camp is particularly fortunate, even compared to the broader landscapes of Wadi Rum, UNESCO listed for their natural beauty. There are a number of comfortable isolated places to relax within the camp but away from the primary infrastructure of the camp. These locations offer an opportunity to experience the silence and isolation of the desert. The stillness, calmness and quiet of the desert is meditative and almost hypnotic. These locations within the broader ranges of the camp offer a special opportunity to feel the truth of the desert. We welcome everyone to take this opportunity to fall inlove with the desert. The camp is equipped with modern bathroom facilities. Facilities have running water and are equivalent to those in Western Europe with western style flushing toilets, conventional showers and sinks. Bathroom facilities are shared for all accomodation types. Water is scarce in the area and although the camp has been established with supply well beyond its requirements, guests are requested to be concious of their consumption. 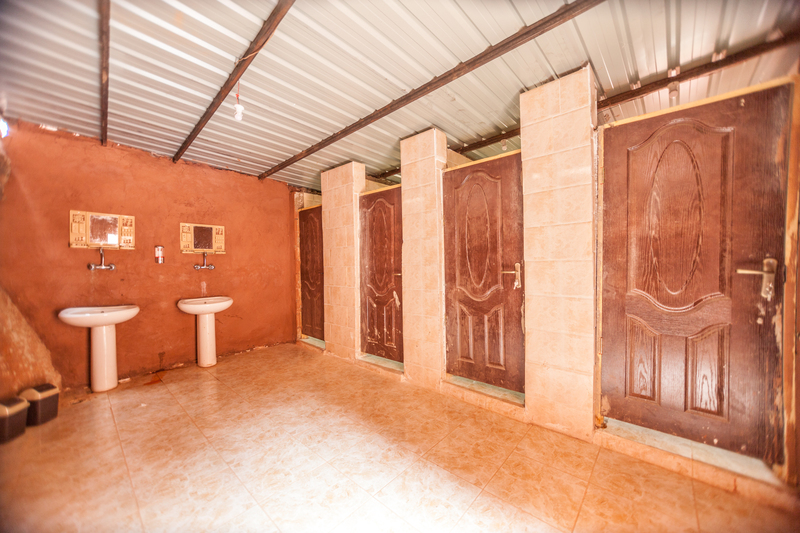 The bathrooms are not consistent with the traditional facilities within the region otherwise, however the camp has been designed this way for the comfort of all guests. The colours and views of the desert landscapes change throughout the day with the high sandstone cliffs and narrow valleys. Sunrise and Sunset are particularly beautiful times to see the desert. The camp arranges both Sunrise and Sunset tours that can either be incorporated into other other daytime tours or stand alone. The camp is located in a valley with tall cliffs running north-south, a short distance from the camp there are opportunities with some of the best sunrise and sunset views in the area. You can walk north of the camp to a small rock arch that is one of the better known locations for sunrise photography. For sunset there is a location a short distance south of the camp which also has exceptional sunset views. There is also a number of memorable walks from the camp including easily accessible Kazali canyon with notable petroglyphs. Alternatively the camp has a number of viewpoints on the surrounding cliffs and guests will find various pleasant places to relax at all hours of the day and night. Breakfasts and dinners are prepared in the camp every morning and night. Breakfasts are similar to those found across the Arab world and include hummus, salad, yogurt, eggs, fool, jam, cheese, halva and flat breads (shrak or pita). Dinner will be cooked in a traditional Zarb. A local cooking method of an oven dug into the sand and cooked with coal. The oven is used to cook both meat and vegetables, the food cooked in a Zarb has a similar result to conventional barbeques dependent on the exact technique used. 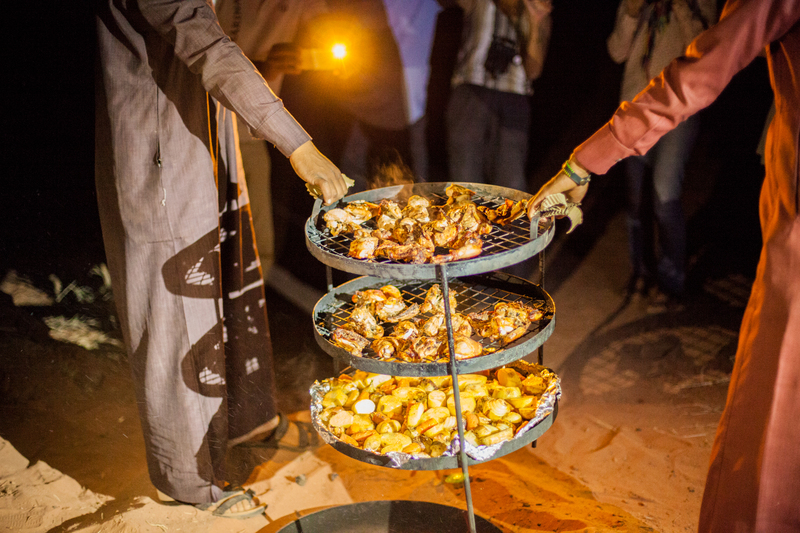 We offer accommodation packages that include meals, although we can also prepare meals for visitors to the camp. Breakfast JOD3, Lunch JOD5, Dinner JOD10. Traditionally tea is central to all social interaction in Bedouin culture, on any occassion when there is a pause in activities or the arrival of a new visitor it is customary to prepare a pot of tea. The tea prepared in the Rum Valley is sweet as is common in the middle east and it is required necessary that the sugar is added before boiling the water, you will also experience local tea infusions such as sage which is considerd to have health properties. Additionally there is a selection of cold drinks and snacks available for purchase at the camp. 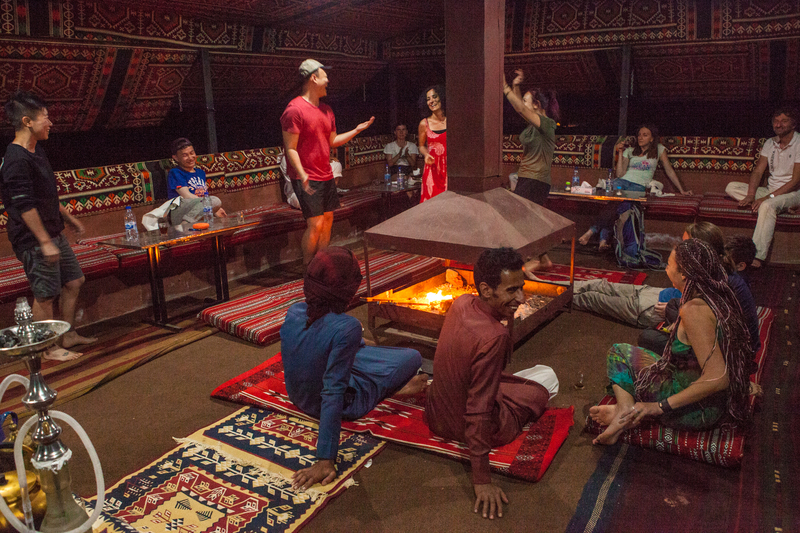 The camp is a quite and peaceful place, it is an enjoyable place to relax whether you feel inclined to socialise over tea or have some quiet time in the desert alone. Photography and Appreciation – There are a number of spectacular view points in and around the camp. Board games – There is a variety of games available for people to interact with and meet other travellers and your hosts. Chill out areas – There are a number of quiet areas for guests to enjoy personal activities such as yoga, meditation or just enjoy the quiet of the desert. Climbing – There is a number of simple climbing and scrambling opportunities at the camp.